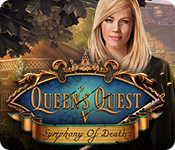 September 10th, 2009 by Big Fish Games in Walkthroughs. 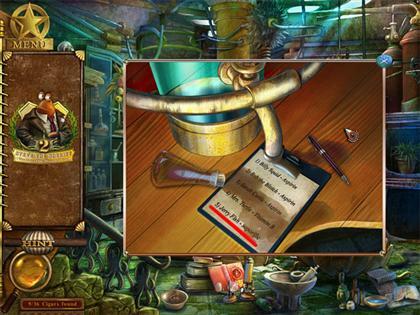 Welcome to the Steve the Sheriff 2: The Case of the Missing Thing Walkthrough! 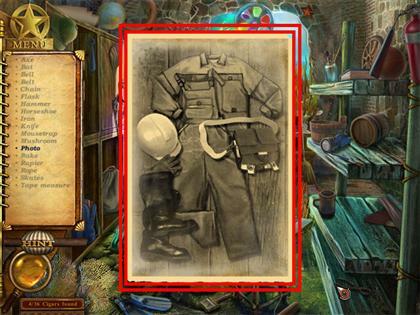 When the trail gets cold investigate our hint-laden Steve the Sheriff 2: The Case of the Missing Thing game walkthrough, with annotated screenshots and video solutions from actual gameplay! If you click randomly on the screen, the cursor will float around the screen for a few seconds. Hover your cursor over an item on the list and the magnifying glass will show you the item’s silhouette. 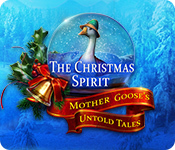 The special tasks for each scene can be found below the list of items. They are always written in blue. When your cursor turns into gears it means that you need to click on the gears for Steve to appear. Steve’s thought bubbles show the items which are needed to move forward with your investigation. 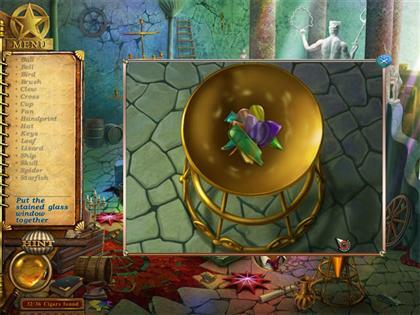 Find the items and drag them to the bubble to complete the task. Not all the items Steve needs will be available right away. Sometimes you have to click on a second set of air bubbles to open a pop-up window in the scene. Air bubbles in the scene alert you to an area that needs attention. Place your mouse over the air bubbles until you see your cursor turn into a magnifying glass. Click on the magnifying glass to get a closer view of that area. 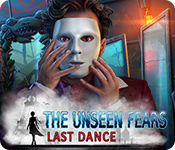 There are unlimited hints in the game. 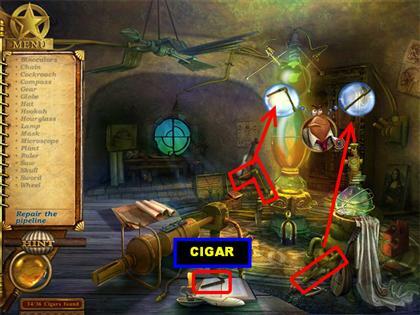 To use a hint, click on the cigar in the lower left corner. 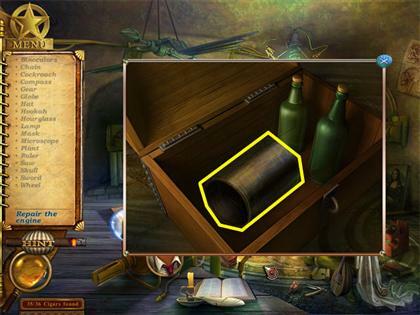 The game will show you the location of a random item on your list. You have to wait a few seconds for hint to recharge before you can use it. 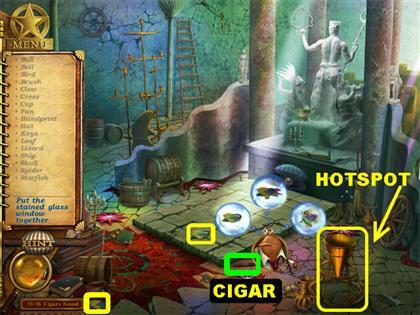 There are 36 cigars to find in the game, find all 36 to unlock a bonus mini-game at the end of the game. 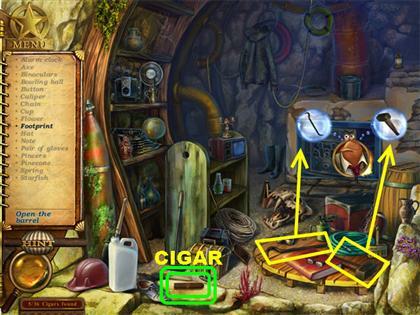 There is a counter in the lower left corner that shows you how many cigars you’ve accumulated and how many more you need to complete the set. 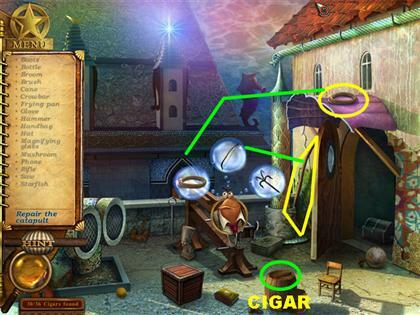 You cannot use a hint to help you find a cigar. 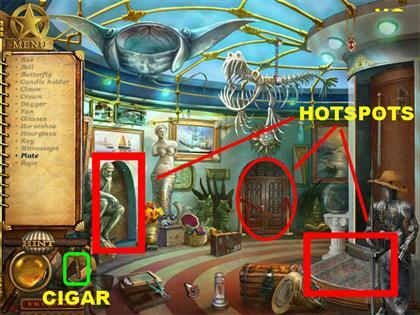 If you see a cigar icon on top of a building on the main map, it means that you forgot to pick up a cigar somewhere on that building. If you don’t see a cigar on top of one of the buildings it means that you’ve collected all the cigars for that location. 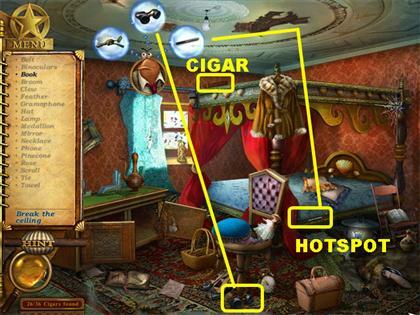 There is only 1 cigar per scene and several cigars in a given location. 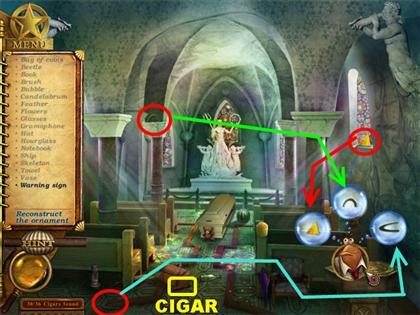 You can always return to a level if you missed a cigar by going to the main map. 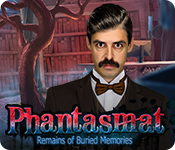 At the end of the game you will be presented with a full box of cigars. 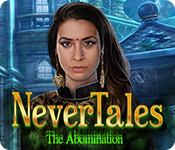 You can mouse over any cigar to read a fun fact about the game. 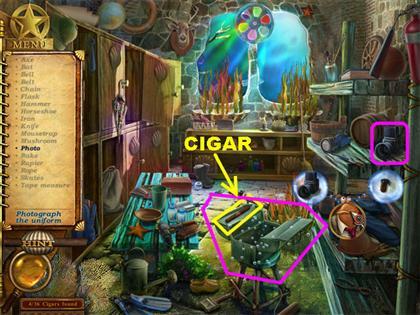 The locations of all the cigars are noted in the walkthrough and are highlighted in the screenshot. 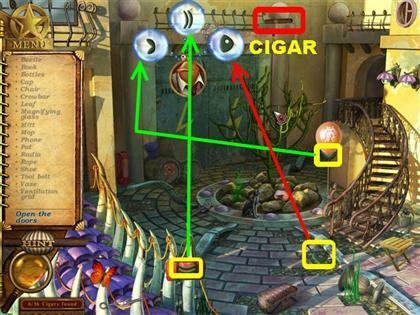 Use the walkthrough to find whatever cigars you are missing. 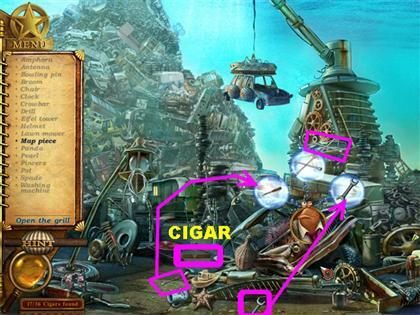 This section gives you the location of all the cigars in the game. 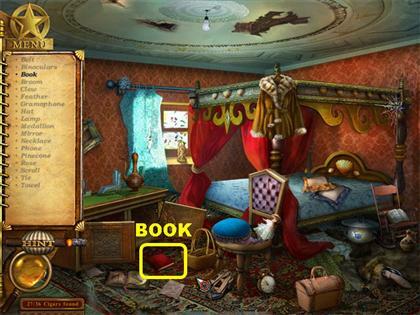 The list has been organized by order of appearance in the game. This list was put in this section to make it easier to find all the cigars. 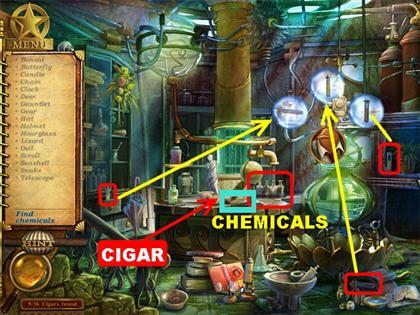 You can also look at the walkthrough for the location of all the cigars. 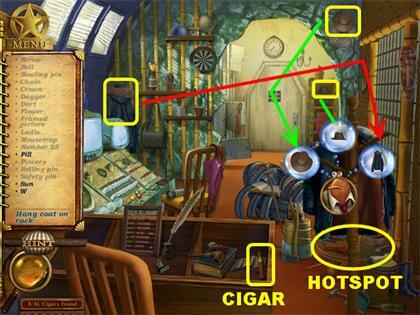 The screenshots in the walkthrough will also show you the exact location of each cigar. Cigar # 1: Museum, main floor, lower left. Cigar # 2: Museum, room, lower right corner, on top of a brown book. Cigar # 3: Police Station, study, on the desk. Cigar # 4: Police Station, director’s office, left side of the desk. Cigar # 5: Security Office, lower right, on the second shelf from the bottom. Cigar # 6: Repair Shop, left side of the desk. Cigar # 7: Repair Shop, changing room and workshop, on the green toolbox. Cigar # 8: Repair Shop, basement, on the lower left side. Cigar # 9: Phone Station, repair desk, on the lower right side of the carpet. Cigar # 10: Phone Station, Garden, in the upper right corner. Cigar # 11: Prison, outside jail, on the crate in the lower right side. Cigar # 12: Prison, inside jail, on the right side of the desk. Cigar # 13: Prison, Octopus’ cell, on the far left side. It is below the blue hanging picture. Cigar # 14: Pharmacy, counter, on the lower left. Cigar # 15: Pharmacy, lab, on the counter, next to the globe. Cigar # 16: Jerry Fish’s House, living room, in the lower left, on the table. Cigar # 17: Jerry Fish’s House, kitchen, on the left side of the table. Cigar # 18: Gas Station, outside, on the red gas can in the lower right side of the scene. Cigar # 19: Gas Station Shop, on the right side of the counter. Cigar # 20: Santa Maria Bar, on top of the book located on top of the bar. Cigar # 21: Santa Maria Bar, table, in the center of the table. Cigar # 22: Santa Maria Bar, backyard, on the lower left, on top of a green book. Cigar # 23: Junkyard, on the lower left corner. Cigar # 24: Junkyard, worker’s trailer, on the left wooden shelf, in front of the red toolbox. Cigar # 24: Junkyard, far side, on the lower left. Cigar # 26: Abandoned House, on the left side of the desk. Cigar # 27: Abandoned House, grand bedroom, on top of the scene, close to the canopy. Cigar # 28: Abandoned House, storage room, on the table in the center, in front of the wooden box. Cigar # 29: Library, on the lower left side, on top of a brown book. Cigar # 30: Library, reading room, in the lower right side. Cigar # 31: Rooftop, on the lower right, on top of the barrel. Cigar # 32: Cathedral, on the lower left side. It is in front of a brown lunch box. Cigar # 33: Cathedral, behind altar, in the lower center of the ground. Cigar # 34: Underground, in the lower right corner. Cigar # 35: Raffaeel’s House, in the lower right. It is on the yellow hat located on the yellow couch. Cigar # 36: Raffaeel’s House, lab. The cigar is in the lower center, on top of the open book. There is a good variety of mini-games in Steve the Sheriff 2. 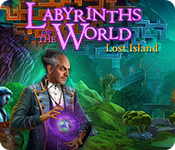 You will be given instructions for each mini-game before you start on them. If you need to read the instructions over you can click on the Help button in the top right side. You can skip any mini-game by clicking on the Skip button in the upper right side. You have to wait until the Skip button is completely red before you can use it. 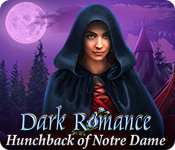 The solutions for all mini-games are noted in the walkthrough. Pick up the cigar in the lower left side. Click on the left door for a closer view. Click on the bubbly valve in the upper center to see Steve’s bubble. Grab the red wheel on the tire in the lower right and drag it to Steve’s bubble. Grab the nut on top of the green gas can and drag it to Steve’s bubble. Once the valve has been fixed, pick up the yellow sponge that falls on the floor. Once you pick up the sponge it will be automatically attached to your cursor. Place the sponge in Steve’s bubble in the lower right corner. Pick up the spray bottle in the upper right side and drag it to Steve’s bubble. Pick up the bucket in the lower left side and drag it to Steve’s bubble. Click on the door with the red ropes in the back of the scene. 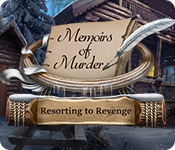 Click on the hotspot in the lower right corner and grab the half scissors in the book. Open the hotspot again and pick up the screw in the upper center. Pick up the other half of the scissors that’s attached to the hand of the figure in the lower right. 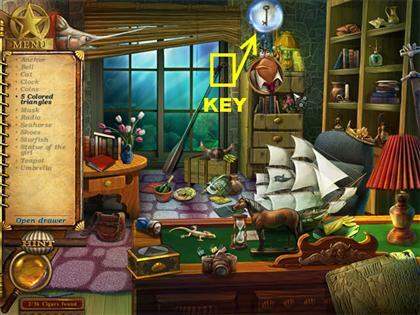 Pick up the cigar in the lower right corner; it is on top of a brown book. Click on the bubbly spot on the right curtain to see Steve’s bubble. Grab the rope in the upper left side and place it on Steve’s bubble. Click on the fish painting on the right wall to see the safe. Click on the safe on the wall to see Steve’s bubble. Grab the wrench located at the bottom of the right curtain and give it to Steve. Grab the awl in the lower left and hand it to Steve. 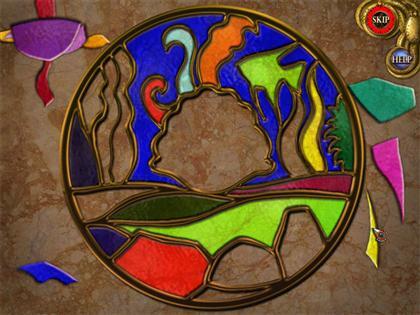 Pick up the stained glass pieces in the scene. They are highlighted in green in the screenshot. 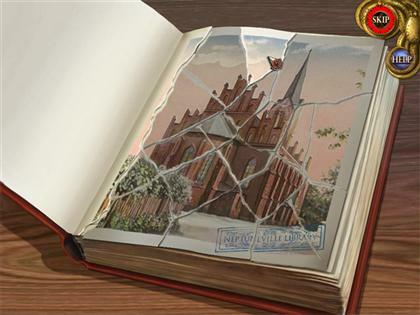 Your goal in this puzzle is to reassemble the stained glass window by placing the pieces in the right spots. You can rotate the jigsaw pieces by right-clicking on them. The piece in the middle will not be filled. When a piece is in the right spot it will lock itself in. Click on the safe after all the pieces have been found. Click on the wires to see Steve’s bubble. 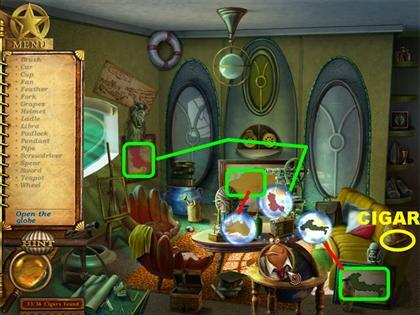 Grab the items circled in the screenshot and drag them to Steve’s bubble. 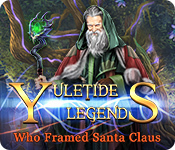 Click on the frame that appears on the back wall. Grab the cigar on the desk. Click in the upper right side to open a hotspot. 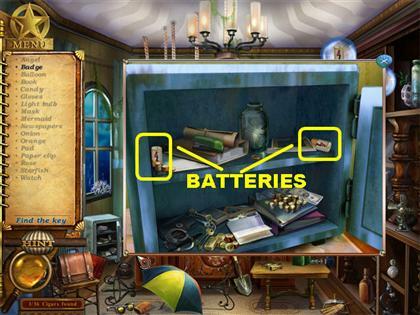 You need to find 3 batteries and a flashlight for this portion of the game. Close this window for now. 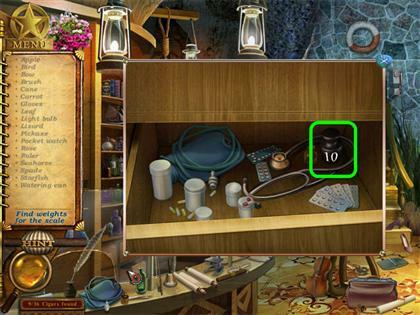 Click on the safe to open a puzzle. Your goal is to arrange the dials to form a complete picture. Drag the dials from left to right until they lock into place. Use the images on the unmovable pieces to align everything correctly. 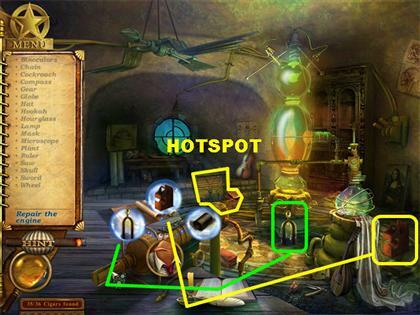 Grab the 2 batteries from the safe and drag them to Steve’s hotspot in the upper right. Once both batteries have been extracted you will no longer have access to the safe. 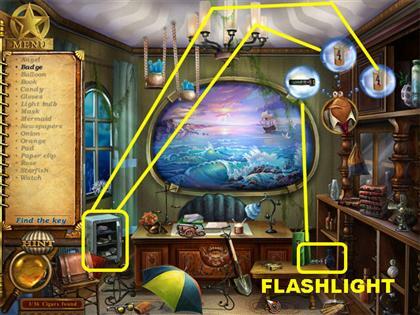 Pick up the flashlight on the small table in the lower right corner. 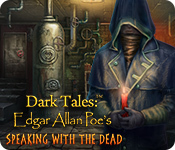 A light shines on the side of the cabinet revealing a small key. Click on the cabinet to reveal Steve’s bubble. Grab the key on the side of the cabinet and drag it to Steve. 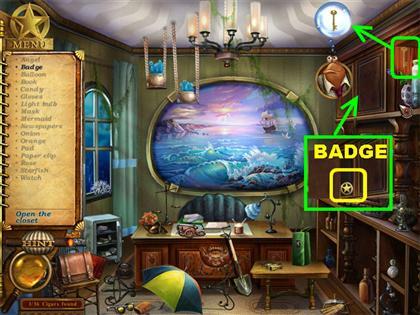 Once the cabinet is open, click on the badge to end this round. Pick up the cigar on the left side of the desk. Click on the pile of garbage in the lower left to open up Steve’s bubble. Place the following 3 items in Steve’s bubble. Grab the broom in front crate by the window. Grab the dust pan next to the broom. Pick up the green bucket in the lower left corner. Please look at the screenshot for the location of the 3 darts. Click on the dartboard in the back of the scene to open Steve’s bubble. Drag all three darts to Steve’s bubble. 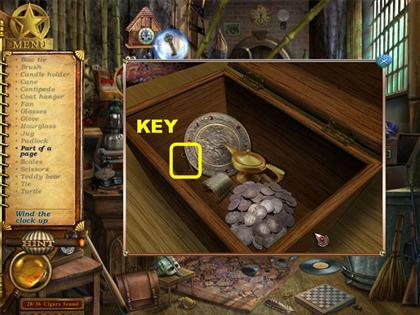 A key appears on the edge of the window, drag it to Steve to open the drawer. 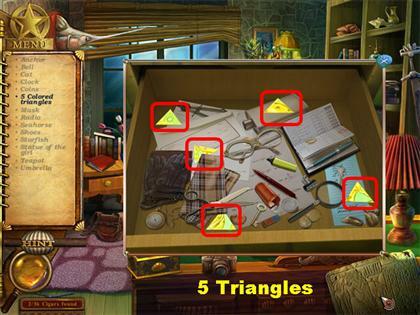 Grab the 5 triangle pieces inside the drawer. 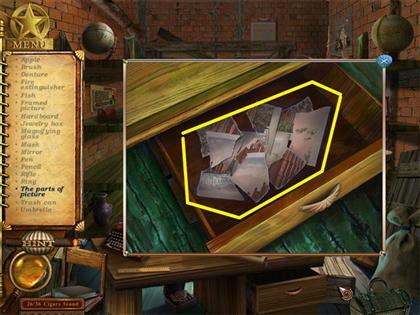 The drawer will automatically close once all the triangle pieces have been found. 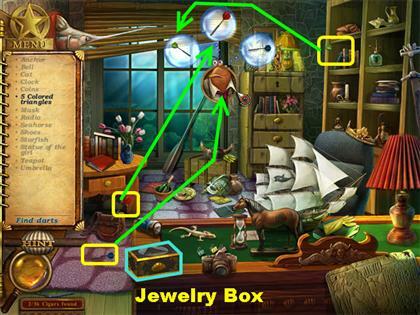 Click on the jewelry box in the lower left to open a puzzle. Reassemble the picture by dragging the triangle pieces in the right spots. You cannot rotate the pieces in this puzzle. A piece will lock itself in when it is in the right spot. Grab the cigar in the lower right. It is on the second shelf from the bottom. Click on the dome on the left to see Steve’s bubble. Grab the wrench on the left side of the floor and place it on Steve’s bubble. Pick up the screwdriver located next to the monitor and hand it to Steve. Click on the controls on the right side of the control panel for a closer view. Click on the toolbox to bring up Steve’s bubble. Grab the spring attached to the red joystick on the left and place it on Steve’s bubble. Pick up the horseshoe located on the top left side of the pop-up window and also place it on Steve’s bubble. Pick up the film reel that slides out from underneath the controls. 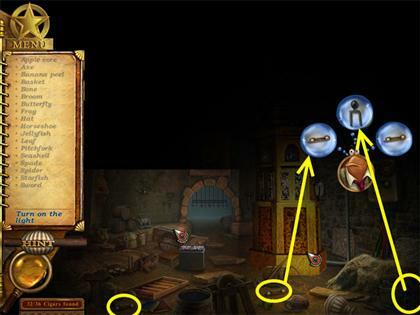 The film reel will be attached to your cursor, place it on Steve’s bubble that appears after you pick up the film reel. 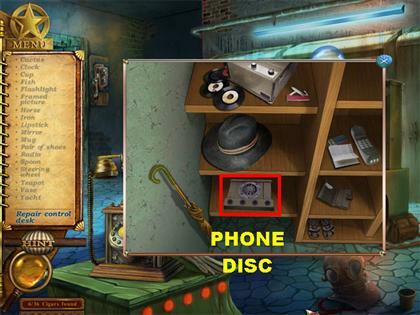 Click on the phonograph on the desk to bring up Steve’s bubble. Grab the record in the upper right side and drag it to Steve. Grab the gramophone horn on the right side of the desk and drag it to Steve. Click on the closet to bring up Steve. When you repaired the gramophone a safety pin appeared at the bottom of the gramophone, pick it up and place it on Steve. Grab the awl in the lower left and give it to Steve. Click on the closet for a closer view. 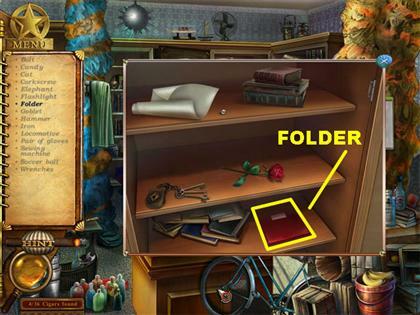 Pick up the red folder at the bottom of the cabinet. Pick up the cigar on the green toolbox. Click on the blue uniform in the lower right to bring up Steve. Grab the camera on the bench above Steve and give it to him. 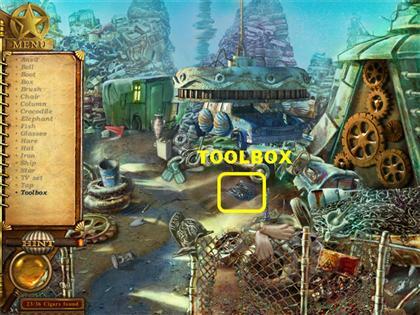 Click on the toolbox for a closer view and grab the roll of film in the corner. Click on the photo of a uniform that appears in the center of the screen. 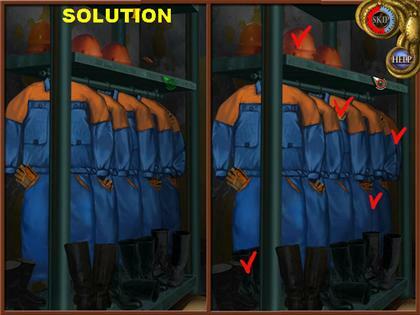 Look for the 5 differences between the 2 pictures. Each time you find a difference a red checkmark will appear on the difference you spotted. Pick up the cigar on the lower left side. Click on the barrel on the right to bring up Steve. Pick up the crowbar in the lower right and give it to Steve. Grab the mallet in the lower right and hand it to Steve. Click on the furnace to bring up Steve. Click on the barrel on the right for a closer view. Pick up the fire extinguisher inside the barrel and hand it to Steve. Click on the open furnace door to bring up Steve. Grab the fire rake and the spade in the lower left side and hand them to Steve. Pick up the small brush in the lower right and give that to Steve as well. 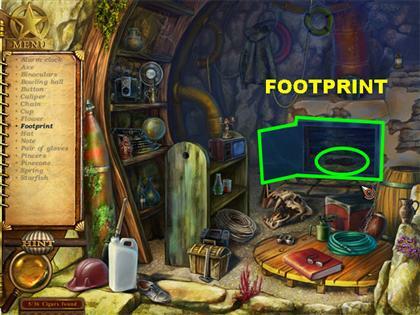 Click on the footprint that appears inside the stove. Pick up the cigar on the lower right side of the carpet. Click on the controls on the right side of the room to bring up Steve. Click on the cabinets on the left for a closer view. Pick up the phone disc in the pop-up window, the window will automatically close. Give the phone disc to Steve. Grab the cigar in the upper right corner. Click on the upper left side of the gate to bring up Steve’s bubble. 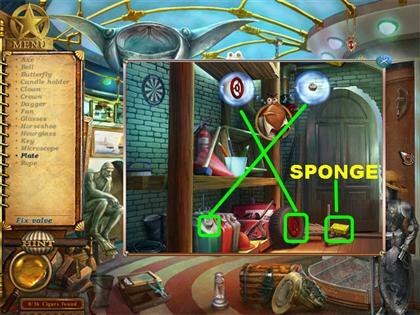 Pick up the 3 geometrical shapes according to the markings on the screenshot and give them to Steve. 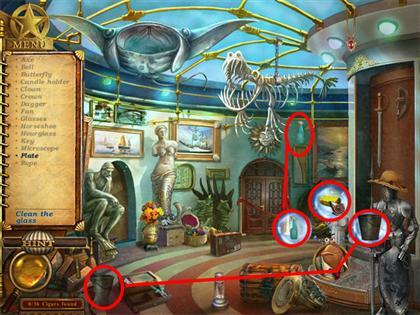 Click on the door after all the geometrical shapes have been placed to enter a new scene. In this section you will be asked to find 4 fuses. 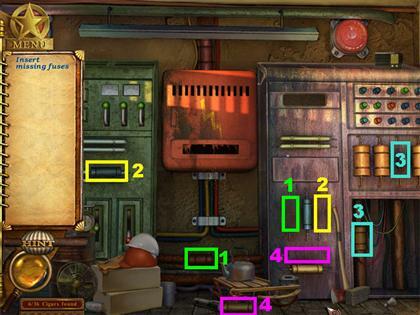 The fuses have to be picked up in a certain order or you will not be able to pick them up. 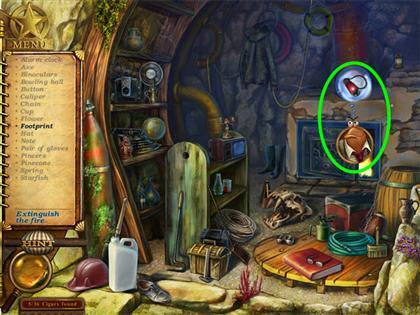 Each time you click on one of the air bubbles Steve will appear and ask you for a particular fuse. Find the fuse he wants and hand it to him. 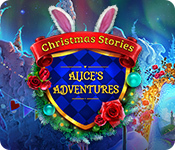 A new set of air bubbles will appear, click on them and repeat the same process until all 4 fuses have been found. After the fuses have been replaced the electrical panel will open. 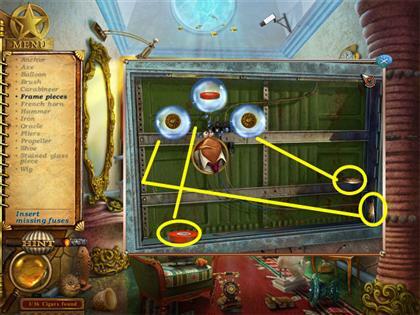 Your goal in this puzzle is to connect all the rings in the right spots using the markings on the right side of the screen. Grab the connectors and place them on the right connect rings on the switchboard. The wires cannot cross or overlap with each other. If you have nowhere to place them move some pieces around to an empty space. The numbers on the boards are pretty faded but they run in numerical order. 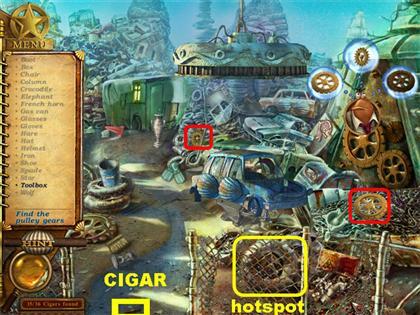 The cigar is on the crate in the lower right. Click on the phone booth and Steve will pop-up. Pick up the crowbar in the lower left and give it to Steve. Grab the pincers in the upper right side and hand it to Steve. Pick up the saw in the lower right corner and give it to Steve. Click on the phone booth for a closer view. Click on the telephone for Steve to appear. Grab the baseball bat in the lower left and give it to Steve. 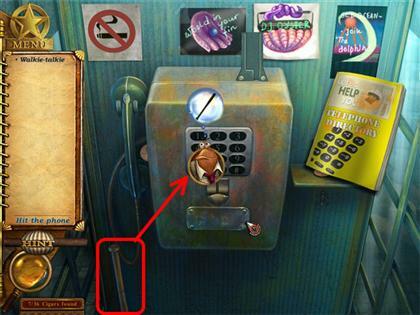 Click on the coin slot above the telephone to see Steve appear. 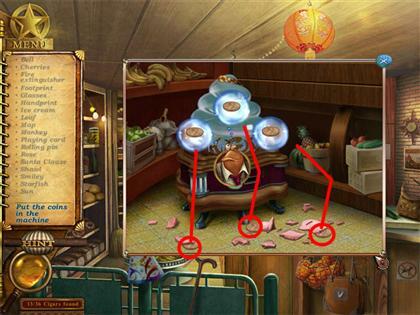 The 3 coins are circled in red in the screenshot. 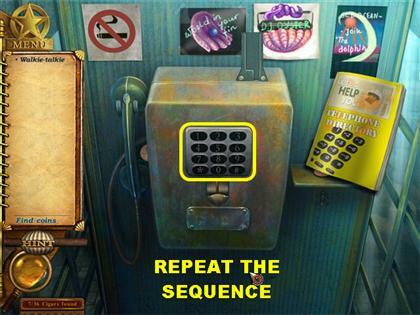 In this mini-game you have to repeat the sequence shown on the telephone pad. 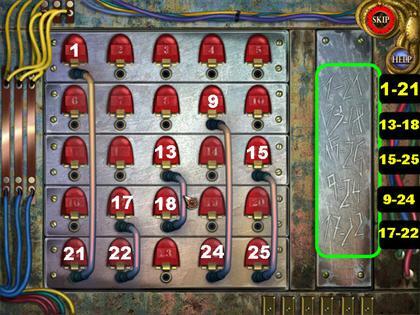 If the sequence is right, the keypad will turn green and one of the coins will fall into the slot. If the sequence is incorrect, the keypad will turn red and you will have to repeat the sequence. Complete 3 sequences to win the game. Grab the walkie-talkie once the phone is open. Pick up the cigar on the right side of the desk. Click on the coat rack to bring up Steve. Pick up the hat in the upper right corner and give it to Steve. Grab the other hat on the shelf on the far right and give it to Steve. Pick up the coat in the upper left side and hand it to Steve. Once the coat rack falls to the ground, click on the small round table for a closer view. Click on the coffee cup to bring up Steve. Hand the spoon on the table to Steve and a pill will appear at the bottom of the cup, click on the pill. 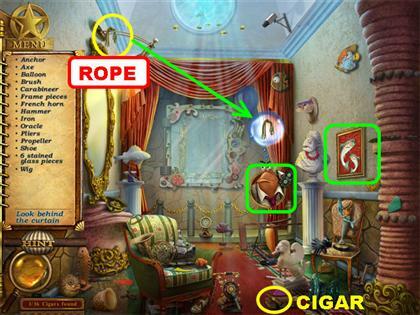 Pick up the cigar on the far left side; it is below the blue hanging picture. Click on the bubbly spot in the lower center and Steve will pop-up. Pick up the drill in the lower left corner. Grab the crowbar behind the striped shirt that is hanging on the coat rack. Click on the trunk on the far left side for a closer view. Pick up the saw inside the trunk and hand it Steve. 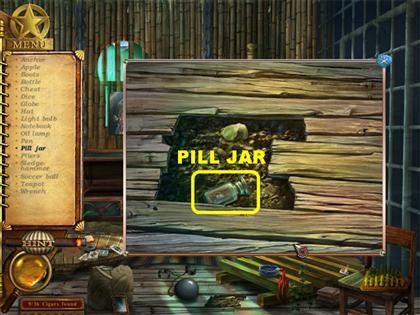 Click on the Octopus’ hiding place in the lower center of the ground and pick up the pill jar in the floor. Pick up the cigar in the lower left. Click on the scale on the left and Steve will pop up. Pick up the weight in the lower right and give it to Steve. Pick up the weight in the lower left and give it to Steve. Click on the hotspot in the lower left for a closer view, pick up the weight and give it to Steve. 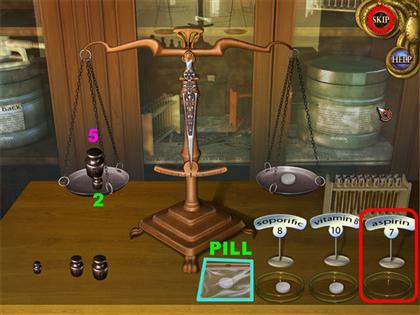 Your goal in this puzzle is to identify the weight of the pills using the 5 weights provided. Place a pill on the right scale. 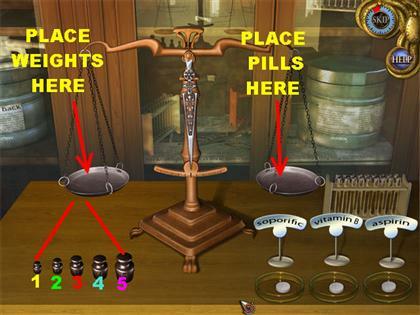 Place weights on the left scale to figure out the weight of the pill. Keep placing weights on the left scale until both scales are balanced. There are 5 weights in the lower left. Each weight weighs 1 to 5 pounds from left to right. 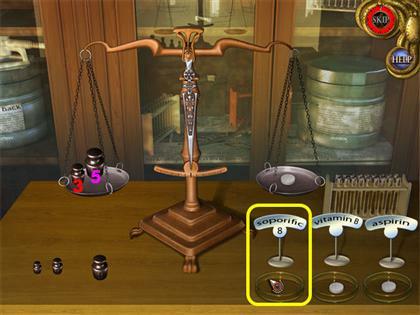 Once you figure out the weight of one pill, that weight will appear on the banner below each pill’s name. Continue measuring the rest of the pills in the same manner. Please look at the next set of screenshots for the weight of all the pills. 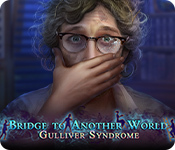 Please make sure that you read the banner associated with each pill since the game will change the order in which the pills appear in the lower right corner. The Saporific Pill is 8 pounds. Place the 3rd and 5th weight on the left scale and the Saporific pill on the right. The Vitamin B pill is 10 pounds. Place the 2nd, 3rd and 5th weight on the left scale and the Vitamin B pill on the right scale. The Aspirin pill is 7 pounds. Place the 2nd and 5th weight on the left scale and the Aspirin on the right scale. Drag the pill out of the plastic bag on the counter and place it on the right scale. Place the 1st, 2nd and 5th weight on the left scale. Pick up the cigar on the counter, next to the globe. 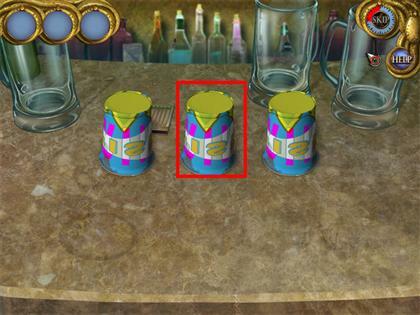 Click on the bottles on the counter for a closer view. The pharmacist tells you that she spilled chemicals all over the list. The pop-up window closes. Click on the large retort on the right and Steve will pop-up. 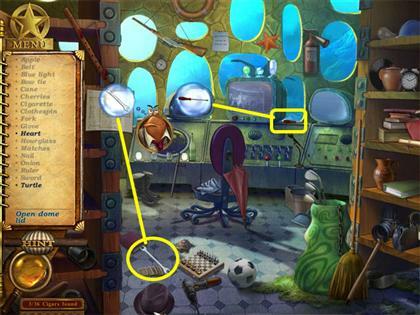 Grab the 3 test tubes marked in the screenshot and put them in Steve’s bubbles. 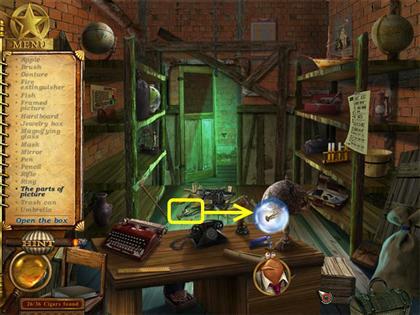 Click on the round glass in the upper left side and Steve will appear. Grab the beaker in the lower right and give it to Steve. 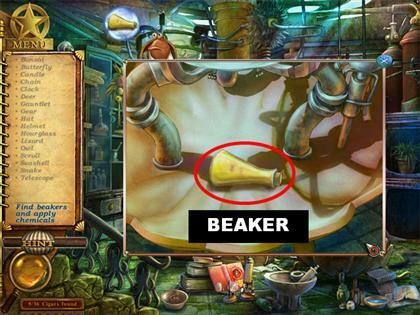 Click on the hotspot in the lower right for a closer view, pick up the beaker and hand it to Steve. The chemicals fall on the clipboard and reveal a clue about the person who purchased the pills. 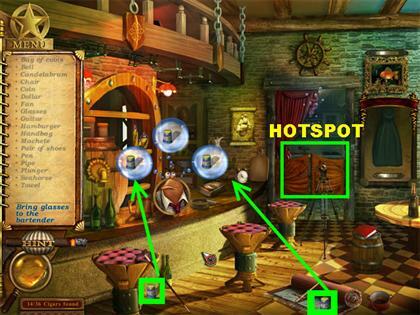 Click on the bubbly spot on the counter for a closer view. 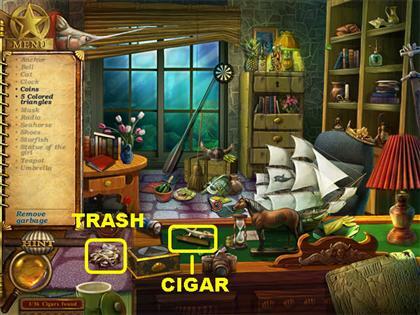 The cigar is in the lower left, on the table. Click in the center of the table and Steve will appear. Click on the ceiling for a closer view, grab the frame and hand it to Steve. 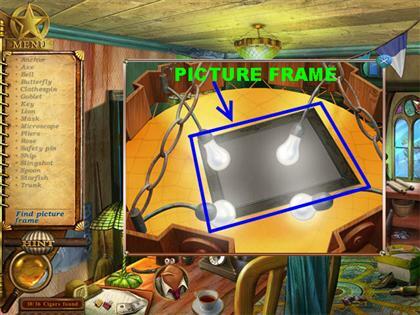 Click on the photo frame on the table and Steve will appear. Pick up the photo pieces in the lower right and hand them to Steve. Pick up the photo pieces on the lower right corner and hand them to Steve. Drag the photo pieces to the frame. 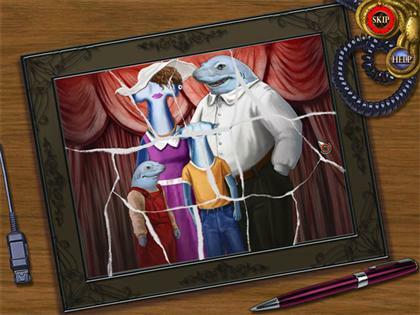 Right-click on the puzzle pieces to rotate them. Pieces placed correctly will lock themselves into place. The cigar is on the left side of the table. Click on the hood in the upper right and Steve will appear. Hand him the broom in the lower right. Click on the left open drawer for a closer view, grab the brush and give it to Steve. Once the hood is clean the helmet will fall on top of the pizza, pick it up to take it off the list. Pick up the cigar on the lower right. It is on top of the red gas can. 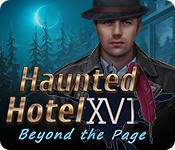 Click on the large shell above the station to make Steve appear. Pick up the stone in the lower left corner and give it to Steve. Pick up the sling in the center of the scene and give it to Steve. Click on the purple spot in the lower right for a closer view. Pick up the elastic for the slingshot and give it to Steve. 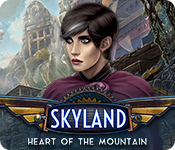 Once the slingshot is complete, a piece of cloth will appear above the gas station. 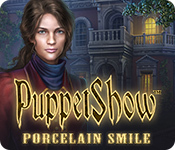 Click on the cloth for a closer view and pick up the match. 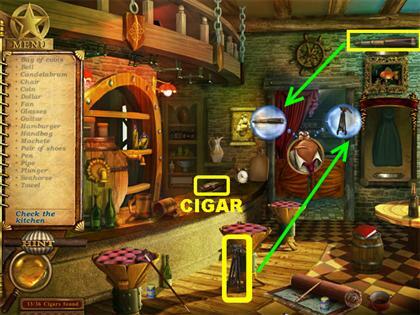 Pick up the cigar on the right side of the counter. Click on the bubbly spot in the upper right to make Steve appear. 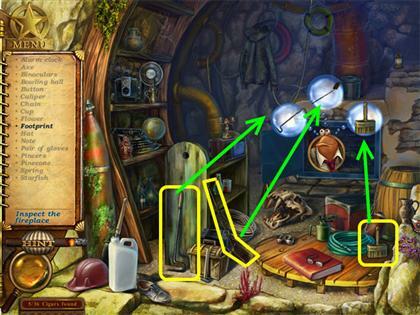 Pick up all the clock pieces as indicated on the screenshot and hand them to Steve. After the alarm clock is repaired it will ring and will make the piggy bank fall to the ground, scattering some coins around. 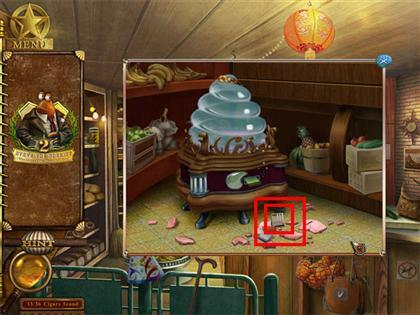 Click on the bubbly spot on the counter for a closer view. Click on the machine’s coin slot for a closer view. 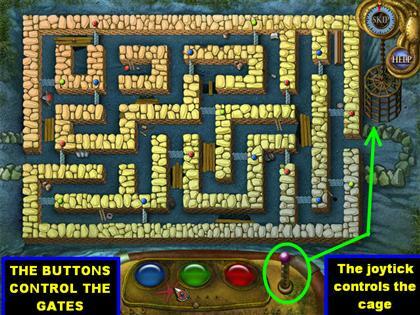 Pick up all the coins according to the markings in the screenshot and hand them to Steve. Click on the book of matches that appears on the counter to trigger a mini-game. 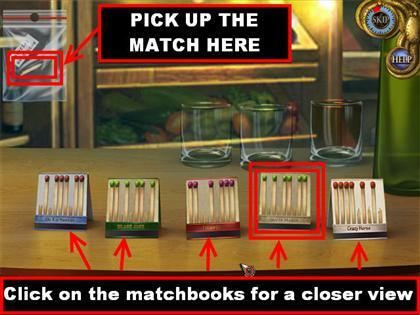 Your goal is to identify which matchbook the matchstick came from. Click on a matchbook for a closer view. Pick up the matchstick in the bag in the upper left corner. Try to match up the matchstick with one of the matches that have been torn off the book. 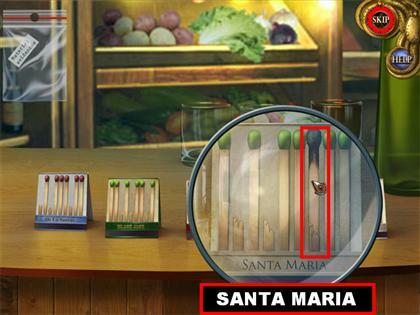 Click on the green matchbook called Santa Maria for a closer view and match up the matchstick with the broken piece on the right. Pick up the cigar on top of the book located on the bar top. 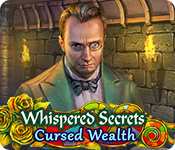 Click on the swinging doors in the back of the bar and Steve will appear. Pick up the telescope in the upper right corner and hand it to Steve. Grab the tripod on the left side of the floor and give it to Steve. 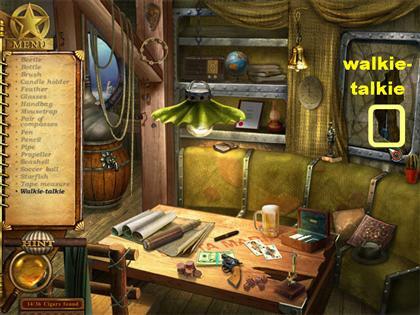 Click on the bubbles located on the bar top, close to the ashtray for Steve to appear. Pick up the glass in the lower right and give it to Steve. Grab the glass on the lower left and hand it to Steve. Click on the swinging doors in the back of the bar for a closer view. Pick up the glass in the middle of the counter and hand it to Steve. 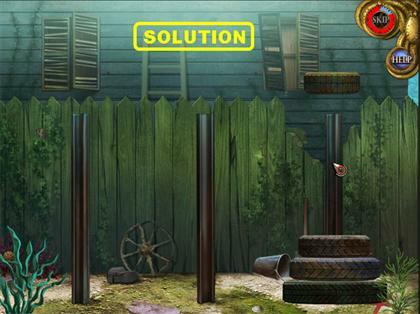 Your goal is to figure out which glass contains the ball. Watch the ball once it goes under a particular glass. The game will start shuffling the ball in a few seconds. Once the glasses stop moving around, click on the one you think contains the ball. 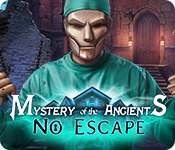 If you’re correct, the game will ask you to guess another two times. If you’re incorrect, you will have to try again. Complete three rounds to win the mini-game. The cigar is in the center of the table. Click on the upper right side of the wall for Steve to appear. Pick up the glove on the left side, close to the barrel and hand it to Steve. Click on the bubbly spot under the table for a closer view. Pick up the other glove. 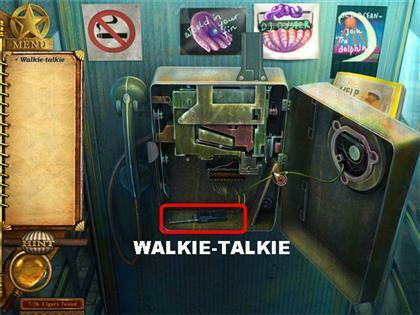 Pick up the walkie-talkie that appears behind the broken glass in the upper right. The cigar is on the lower left, on top of a green book. Click on the bubbly spot in the lower right side of the garage for Steve to appear. Pick up the cable reel in the lower center and hand it to Steve. Grab the gear on the garage door and give it to Steve. Pick up the handle in the lower left corner and give it to Steve. The garage door will lift once all the items have been placed. Click on the car for a closer view and pick up the blue bag. 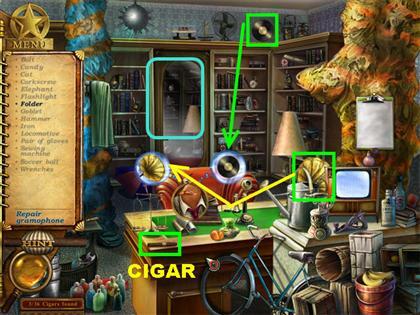 The cigar is on the lower left corner. Click on the bubbly spot in the upper right for Steve to appear. 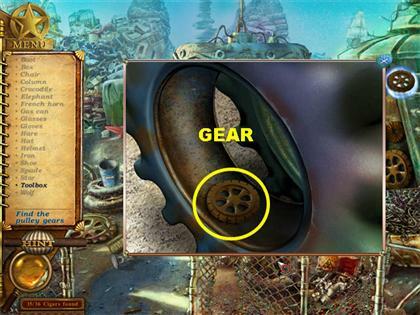 Pick up the 2 gears according to the markings on the screenshot and hand them to Steve. 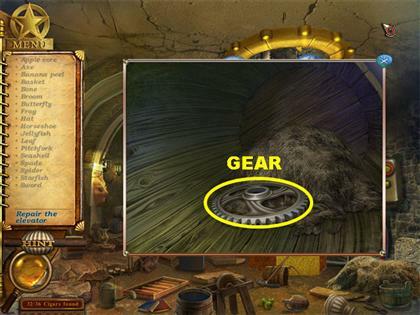 Click on the tire in the lower right for a closer view and pick up the third gear. Once the gears are in place, the crane will lift one of the cars up. Pick up the toolbox that appears on the ground. 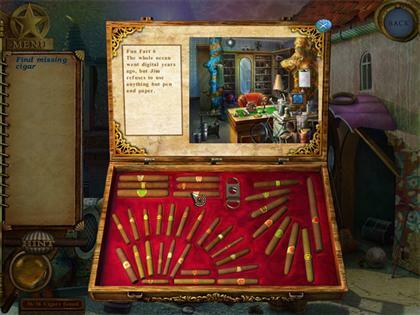 The cigar is on the left wooden shelf, it is in front of the red toolbox. Click on the bubbly spot in the lower right side of the ground for Steve to appear. Pick up the yellow oxygen tank in the lower right and hand it to Steve. Grab the welding mask in the lower left and give it to Steve. Pick up the coulter in the lower center and hand it to Steve as well. 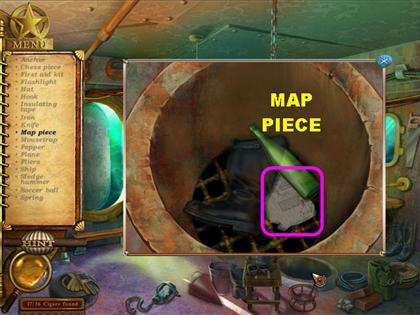 Click on the hatch after all the items have been retrieved and pick up the map piece. Pick up the cigar on the lower left. Click on the bubble spot in the lower right for Steve to appear. Hand him the wrench in the lower center of the ground. Give him the screwdriver in the lower left. 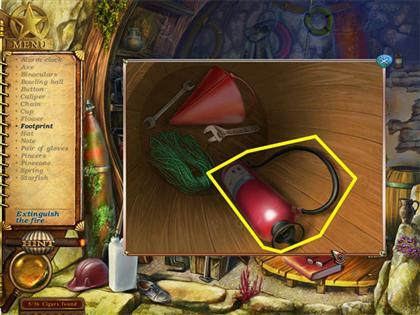 Pick up the tire iron in the upper right, it is directly above the bubble for this item, and hand it to Steve. 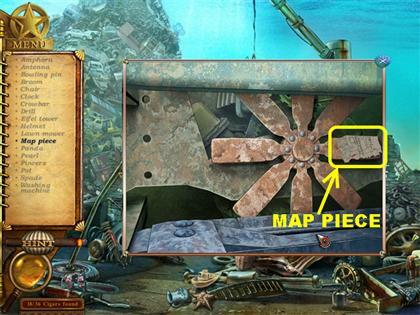 Click on the radiator in the lower right for a closer view and pick up the map piece. A tire with a larger diameter cannot be placed on a tire with a smaller one. 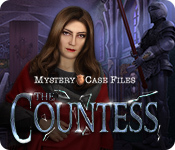 Please watch the video for a step-by-step solution for this puzzle. 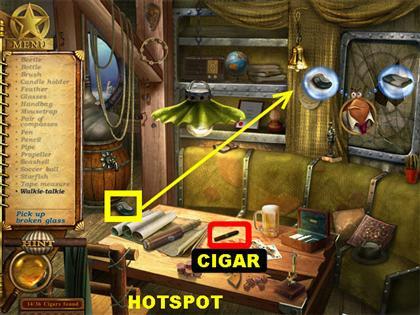 The cigar is on the left side of the desk. Click on the chained anvil hanging from the ceiling to make Steve appear. The glove in the lower left side, it is on the chair. The blade is in the upper right corner. The handle is on the lower right corner. Once the chain is cut the anvil will fall to the ground. Click on the right drawer, pick up the key in the middle of the floor and give it to Steve. Click on the drawer again to open it. Pick up the picture pieces inside the drawer. The cigar is on top of the scene, close to the canopy. Pick up the goggles on the lower center of the ground. Pick up the drill bit on the side of the bed and give it to Steve. 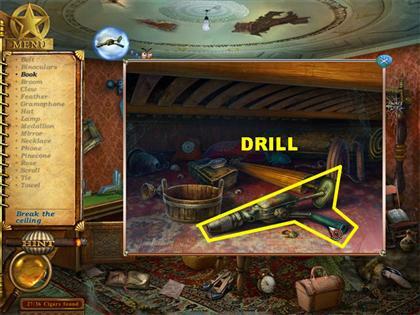 Click on the hotspot under the bed for a closer view and grab the drill. A book will fall on the ground after the ceiling has been fixed, pick it up. Pick up the cigar on the table in the center. It is in front of the wooden box. Click on the clock in the upper left side to make Steve appear. Pick up the pendulum and weight in the lower right side of the screen. 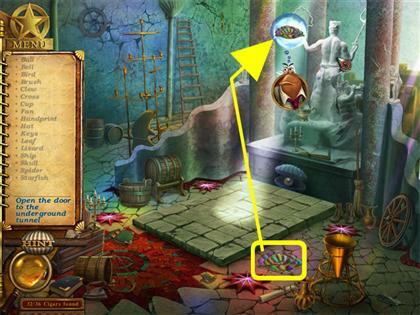 Click on the open jewelry box on the round table in the center of the room for a closer view. Pick up the key that is partially hidden by the plate and give the key to Steve. 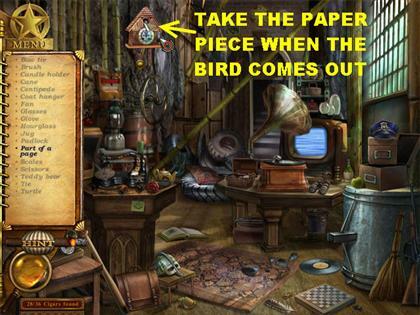 Once the cuckoo clock has been fixed the bird will go in and out of the clock. Grab the paper from the bird. 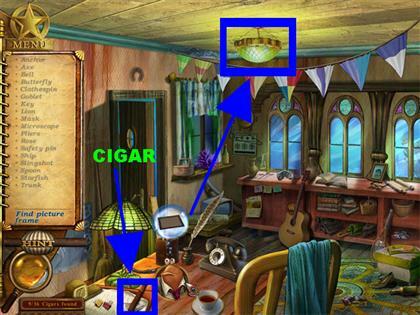 Pick up the cigar in the lower left side, it is on top of a brown book. Click on the bubbly spot on the right for Steve to pop-up. 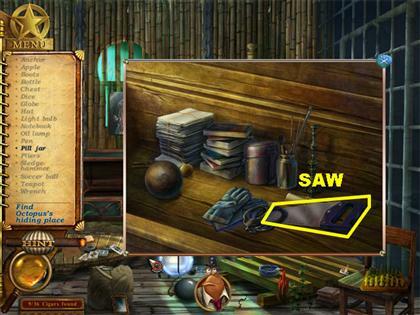 Pick up the 2 pieces of the mechanical librarian marked in the screenshot. Click on the chair on the left for a closer view. Pick up the third piece of the mechanical librarian on the chair. 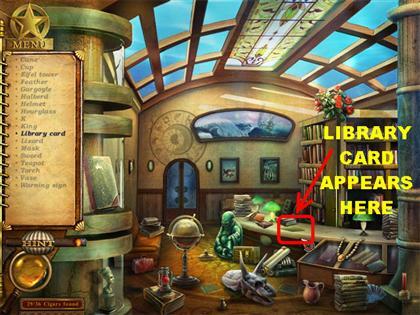 Pick up the library card that appears on the counter after the mechanical librarian has been fixed. Pick up the cigar in the lower right. Click on the broken ladder on the right for a closer view. Pick up the 2 ladder pieces on the lower left. Pick up the last ladder piece on the lower right. Click on top of the closet for a closer view. 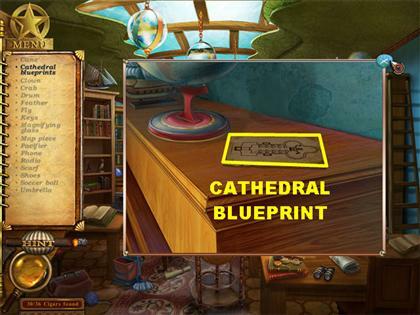 Pick up the cathedral blueprint in the pop-up window. Pick up the cigar on the lower right. It is on top of the barrel. Click on the catapult for Steve to appear. 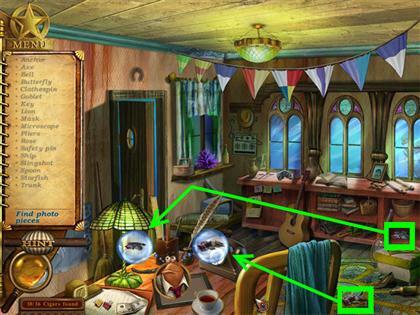 Pick up the rope on the top right side; on the purple area above the door. Pick up the bow next to the door and hand it to Steve. 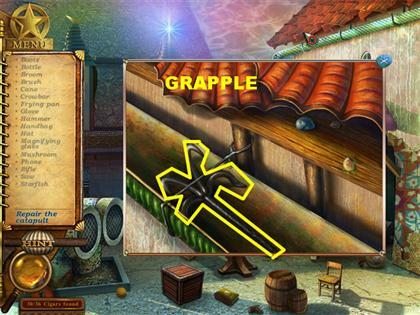 Click on the roof for a closer view and pick up the grapple. 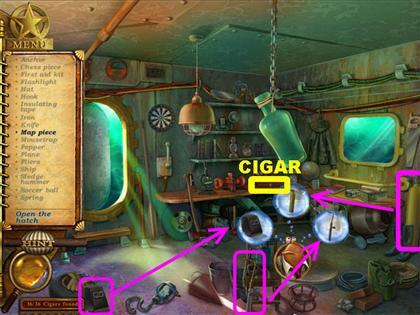 The cigar is on the lower left side. It is in front of a brown lunch box. Click on small round table for Steve to appear. 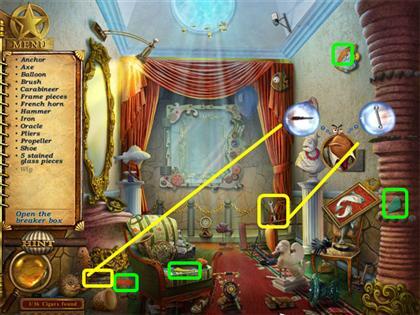 Pick up the 3 geometrical pieces according to the markings on the screenshot and hand them to Steve. Click on the table in the lower right after it’s been fixed for a closer view. 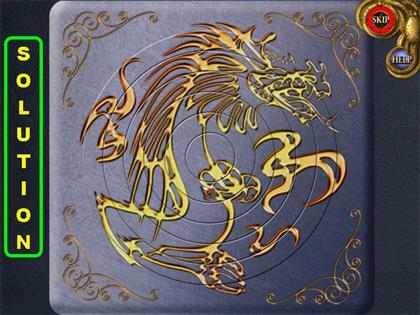 Pick up the warning sign that appears inside the table. 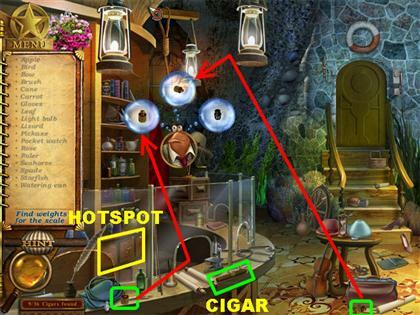 Pick up the cigar in the lower center of the ground. Click on the bubbly spot in the lower right for Steve to appear. 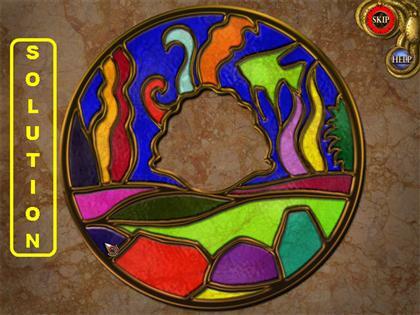 Pick up the stained glass pieces on the lower left and give them to Steve. Pick up the stained glass pieces in the lower center and give them to Steve. 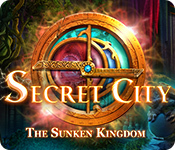 Click on the golden stand in the lower right for a closer view and pick up the stained glass piece. Drag the pieces to the frame. Some of the pieces can be hard to rotate in this puzzle. 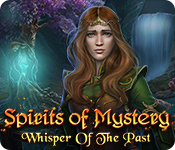 Your best bet is to click, hold and right-click so the pieces can move with ease. 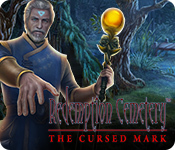 Click on the statue’s raised arm for Steve to appear. Pick up the stained glass window piece on the lower right and give it to Steve. 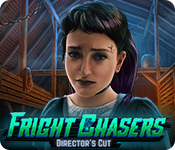 When you first enter the scene it will be dark, you will only have a spotlight to search the area. Click on the switchbox on the right for Steve to pop-up. Pick up the fuse in the lower left corner. Pick up the other fuse in the lower center of the ground. Pick up the handle in the lower right corner. Once Steve receives all the pieces the lights will come back on. Pick up the cigar in the lower right corner. Pick up the battery in the lower center. Click on the barrel in the back of the scene for a closer view and pick up the gear. Your goal is to get the ex-cook under the cage on the right. Open and close the doors using the colored buttons. Use the lever to drop the cage on the ex-cook. 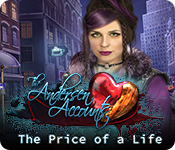 You will be automatically returned to the jail cell once the mini-game is finished. Please look at the video for a step-by-step solution for this mini-game. Click on Octopus’ drawing in the middle of the floor. Pick up the cigar on the lower right. It is on the yellow hat located on the yellow couch. Click on the globe for Steve to appear. 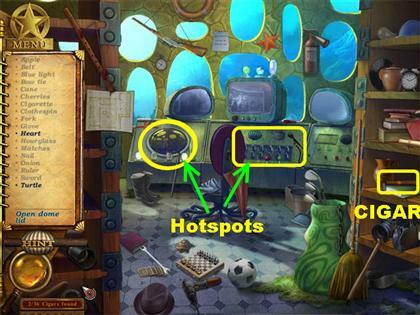 Pick up the 3 map pieces marked in the screenshot and hand them to Steve. Click on the back wall for Steve to appear. 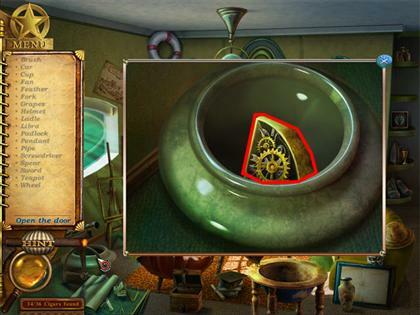 Pick up the device piece inside the open globe. 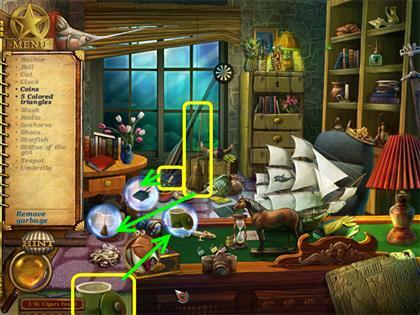 Click on the green vase in the lower left for a closer view and pick up the other device piece. The cigar is in the lower center, on top of the open book. Click on the bubbly part on the right side for Steve to appear. 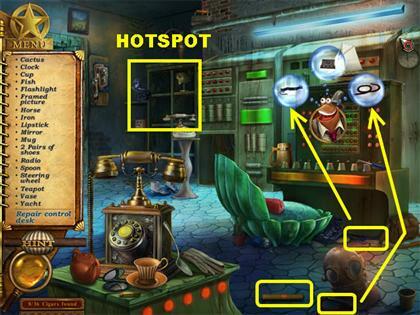 Pick up the 2 pipe pieces marked in the screenshot and hand them to Steve. Click on the bubbles in the lower left side for Steve to appear. Grab the 2 engine parts shown in the screenshot and hand them to Steve. 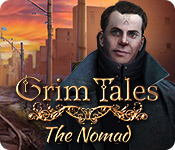 Click on the trunk in the back of the scene for a closer view and pick up the last engine piece. Your goal is to find the right sequence by performing a paint analysis. 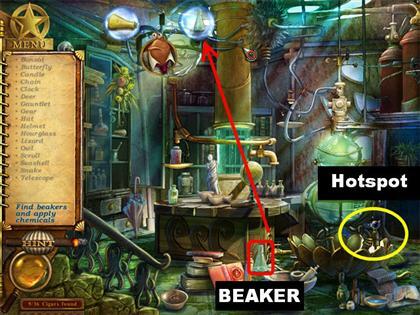 Use the dropper to pick up a chemical from one of the jars. 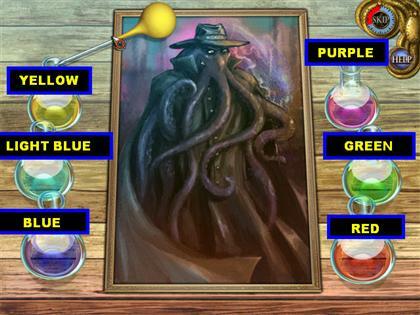 Click whatever color you chose on the painting. If the color you chose is correct, you will see a reaction on the painting. If the color you chose is incorrect you will not see any reaction at all, choose a different color until you see a reaction. 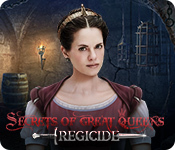 Obtain 5 reactions to complete the mini-game. To unlock the bonus game you must find all the cigars. 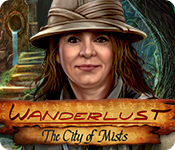 If you haven’t found them by the end of the game you will be prompted to press play in the upper right corner. 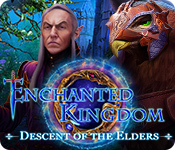 You will be taken to the main map. 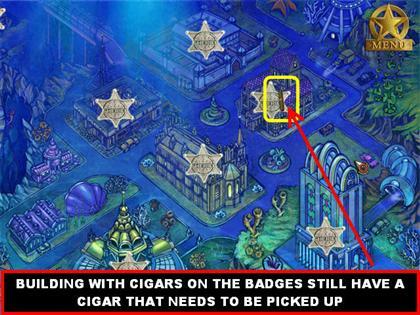 Look for the buildings that have the cigars on the badge, those are the ones in which you failed to pick up a cigar. If the building does not have a cigar on top, you do not need to look in there. 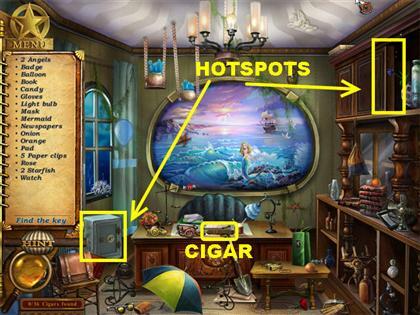 You cannot use a hint to find the cigars. 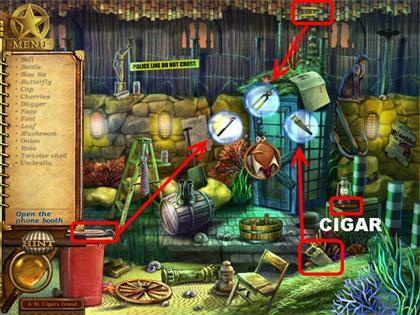 Once all the cigars have been found, you can play the bonus mini-game. 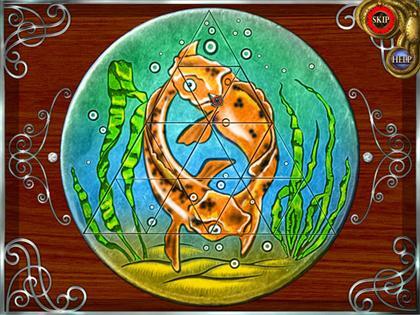 The object of this mini-game is to place bets on the seahorses so you can triple your money if you win. 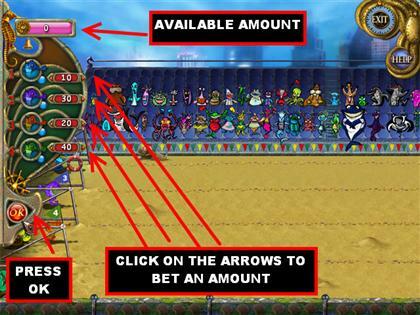 Click on the right arrows next to the seahorse’s icon to bet the amount you want for that seahorse. 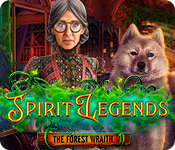 If you bet too much, click on the left arrow to decrease the amount. Your available amount is shown to you in the upper left side. You can place bets on multiple seahorses as long as you have enough money to do so. 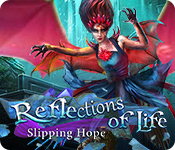 Once you’ve placed your bets click on the OK button in the lower left and watch those seahorses run!